While we’re still weeks away from regular snowfall, a flurry of fundraising activity is underway at a local ski club. Eau Claire’s Flying Eagles Ski Club recently kicked off its first-ever capital campaign. Dubbed “Flight into the Future,” the fundraising effort is aimed at raising $2 million to invest in club infrastructure and an endowment. The campaign aims to address three key strategic needs of the club: completing a hill upgrade at the Mount Washington Nordic Ski Center; facility and infrastructure upgrades at Silver Mine Hill; and creating an endowment to support ongoing club maintenance. The fundraising effort is off to an early start, with more than 40 percent of its goal already raised. With a $150,000 gift, Charter Bank was an early and key supporter of the effort, Mattoon says. Charter Bank President Paul Kohler also serves as campaign vice chairman. Eau Claire is home to two distinct ski jumping facilities that give athletes places to train. Mount Washington, located just up the Menomonie Street hill in the Shawtown neighborhood, is home to the junior facility where young jumpers earn their “ski legs” and learn the fundamentals of the sport on smaller 7-, 15-, 30-, and 40-meter hills. Half of the campaign funds will be directed toward improvements to the Mount Washington site. There, the club seeks to replace the existing 40-meter hill with a larger 55-meter jump. While the upgraded size may not seem like a large difference to the layperson, to jumpers it can make all the difference. A few miles to the southwest is the mammoth Silver Mine Hill, some to the senior club. Unlike the junior hills, Silver Mine is an Olympic-sized 90-meter jump meant for experienced skiers ready for a real challenge. Much of the remaining funding will be dedicated to infrastructure and facility improvements here, including upgrades to existing lighting, spectator seating, a new pavilion, and the judges’ booth. The club also recently completed a joint project with Chippewa Valley Technical College students. The effort brought significant upgrades to electrical lines at the jump. This winter Silver Mine will welcome back a FIS Cup competition for the second year in a row. The tournaments here are some of the most competitive in the world, and Silver Mine is a prime proving ground for young Olympic hopefuls. Last year’s event saw national teams from around the world travel to Eau Claire to compete. Founded in 1886, the Flying Eagles have a long tradition of fostering local ski jumping and Nordic skiing talent and of bringing world-class athletes to the area. 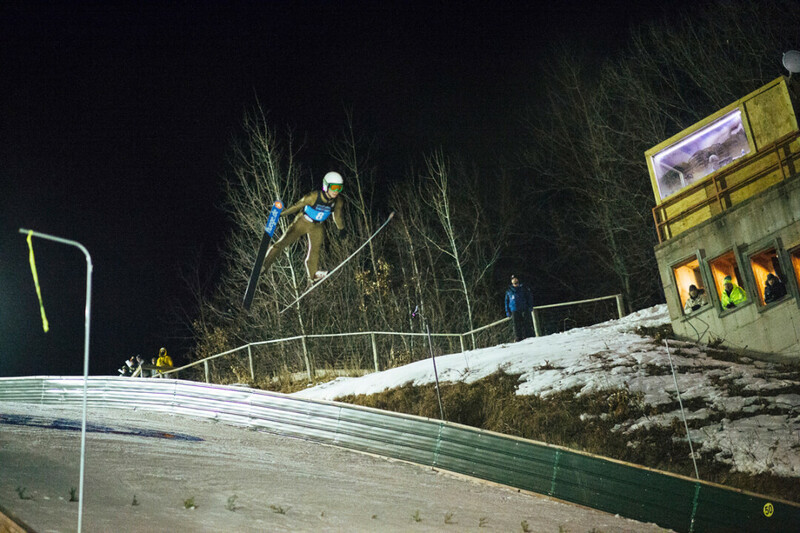 The Flying Eagles are part of a vibrant ski jumping community in the Upper Midwest, with other clubs in Minneapolis, Duluth, Madison, Chicago, and other locations nearby. To learn more about the Flight into the Future campaign or to donate, contact Dan Mattoon at dmattoon@prestigeautocorp.com.